IT'S been a very busy start to the year at the adoption centre at Fishcross. There is hardly a week goes by when all the pens are not full. Luckily we get plenty of visitors at the weekends and that has resulted in lots of cats and kittens finding lovely new homes. Whether you are looking for a kitten, an older cat, an indoor cat or one that loves exploring the outdoors, we are sure to be able to find the purr-fect kitty for you! Pictured is cute little Daisy who just went to her new home recently. Maybe you are thinking of adopting a pair of cats, well we can help you there too! We have lots of new cats coming in over the next few days so why not drop in and see them at the weekend. We are open Saturday and Sunday from 1-3pm. Not all the new cats will be ready to be rehomed immediately as they still have to be vet checked, microchipped etc. But that doesn't mean you can't express an interest in them. Remember too that not all the cats in the centre are on the website. The cats on the website are usually the ones that are ready to be rehomed immediately. 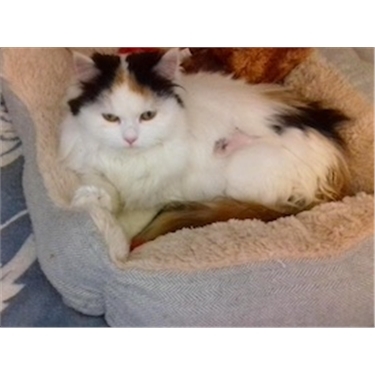 Our adoption fee is still £60 and all our cats come neutered and microchipped and with all innoculations up to date. Our cats are waiting for you! Looking forward to seeing you soon.